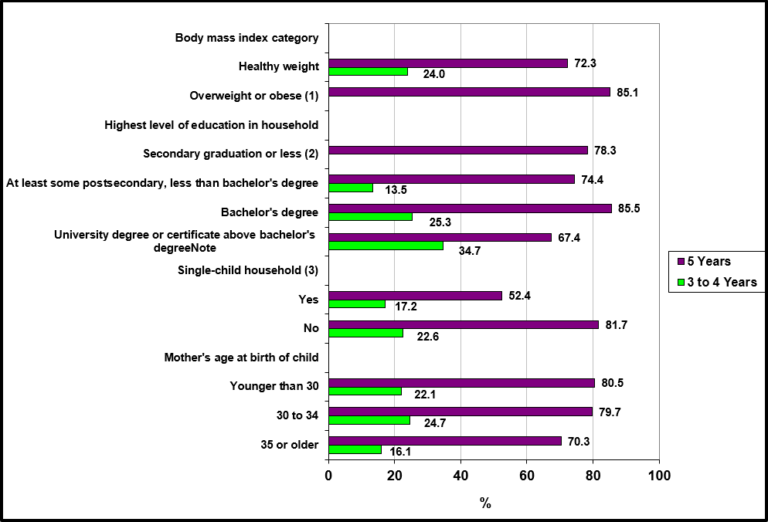 **Overweight or obese: Ages 3 to 4- data too unreliable to be published. ***Secondary graduation or less: Ages 3 to 4- data too unreliable to be published. ****Single-child household: both age groups, use with caution. The guidelines for screen time for 3 to 4 year-olds are no more than one hour per day, and for 5 year-olds no more than two hours a day. Between 2009 and 2013, 3 to 4 year-olds who were in households with a lower level of parental education were less likely than those in higher level of education households to meet the guidelines for screen time. 5 year-olds in households with no other children were less likely to meet the guidelines than were those in households with other children.